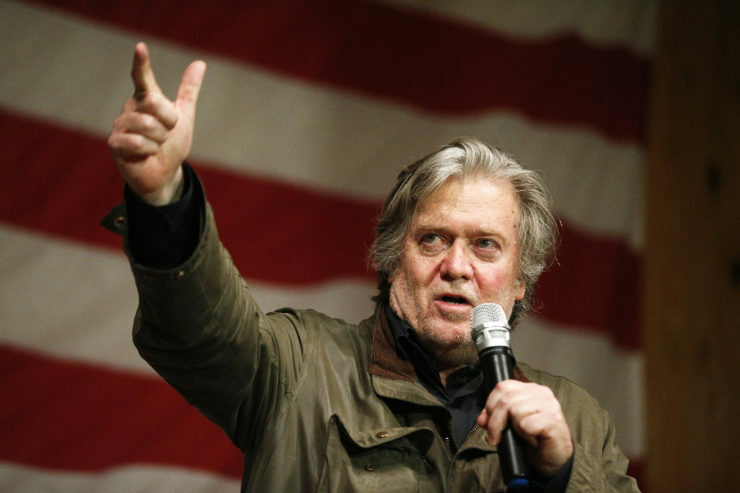 Former White House strategist Steve Bannon speaks during a rally for U.S. Senate hopeful Roy Moore in Fairhope, Ala.
Former White House chief strategist Steve Bannon has disclosed the source of $2 million in debt, which he previously failed to report, on a revised government document released Tuesday. The corrected disclosure follows a Center for Public Integrity investigation in July that revealed Bannon’s omission. The Center for Public Integrity used public records to report the source of three of the debts as JPMorgan Chase – a government contractor and powerful political force – and the fourth as Quicken Loans. The revised filing for Bannon, whom Trump fired in August, officially confirms this. The Center for Public Integrity discovered Bannon’s omission as part of #CitizenSleuth, a joint reporting project with Reveal from the Center for Investigative Reporting that asked the public help identify errors or potential conflicts of interest contained within top government officials’ personal financial disclosures. The White House promised to correct Bannon’s disclosure following the Center for Public Integrity’s report in July. But it didn’t release Bannon’s amended document until this week. The White House did not immediately respond to questions about the new disclosure. Bannon could not immediately be reached for comment. Reached by phone this afternoon, Arthur Schwartz, a Bannon spokesman, said he’d attempt to reach him. Bannon’s newest disclosure document is a product of several previous iterations: It’s been edited on seven separate occasions from May to October to add or clarify a handful of items, including formal disclosure of Bannon’s role as CEO of Trump’s campaign. Bannon’s newest disclosure offered a few new, if minor, details about his ties to businesses backed by conservative billionaire Robert Mercer. Those businesses include Cambridge Analytica (a voter targeting operation Bannon now reports as providing “data analysis”) and several limited liability companies involved in making movies advancing nationalist causes, such as fighting militant Islam and defeating liberal politicians, including 2016 Democratic presidential nominee Hillary Clinton (now reported as “film industry”). The correction comes amid a series of reported lapses on the disclosures of senior executive branch officials, including more than 70 financial holdings left off the public disclosure of White House senior adviser and presidential son-in-law Jared Kushner. The New York Times reported Kushner also omitted contacts with Russian officials on a separate non-public form submitted as part of a background check. McClatchy reported last month that disclosures that several former Trump administration officials, including Bannon, must file upon exiting government had not yet been released. In Bannon’s case, White House ethics officials approved the form with missing information, raising questions about the ability of senior officials to skirt disclosure requirements. Here’s how you can help us investigate the Trump administration’s financial disclosures. The Center for Public Integrity is a nonpartisan Washington, D.C.-based news organization dedicated to producing original investigative journalism on issues of public concern.